Following on from my previous blog in this yoga series, I’m continuing with feet. Our feet are a masterpiece of natural engineering, however this masterpiece is not used to its full advantage in our civilised world. Shoes and flat, paved surfaces block nature’s proprioception and allow the feet to be indifferent to the environment and the surroundings. The less we use our feet the weaker the detailed musculature become, and the weaker the muscles then more pressure is placed on the plantar fascia, causing heel spurs and plantar fasciitis. Each foot has 3 main arches: from the heel to the distal end of the first metatarsal (base of big toe), from the heel to the distal end of the fifth metatarsal (base of little toe) and the line connecting the distal ends of the first and fifth metatarsal. 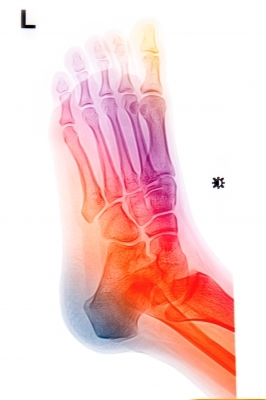 This creates a triangle of support for each foot. There is also a 4th arch which goes across the tarsal bones. So my advice is to pay attention to your foundation: your feet. Take off your shoes and reconnect with the earth and the environment. Take time to stand quietly in Tadasana, focusing on your feet, how they feel, how your weight shifts and balances. Try “lifting” your arches and see how this ripples up through the rest of your body, improving posture and balance. Read my previous blog in this series [Yoga Series #1] Yoga for Foot Health. Yoga Anatomy by Leslie Kaminoff and Amy Matthews. I love this blog, as Reflexology teacher and a Yoga A&P teacher its right up my street! A lovely description of how our feet our our foundation.